Here I am with the lazy recipe of the week. I know this should belong to the column For Dummies, but because of the famous marketing's laws, I decided it's better to introduce it as a minimalist recipe. It's so chic! I could go on and say that the roasting process intensifies and celebrates grapes' inherent sweetness, at the same time creating a new taste and texture, with sweet and savory notes that make them an unusual but perfect addition to cheese plates, salads, and meat dishes. Persuaded? Not yet? Well, you're quite difficult today. Just take these cooked grapes, throw them on some cheese, on a piece of bread, in between two rocket leaves, and stop whining. black grapes, small and seedless about 1 lb. 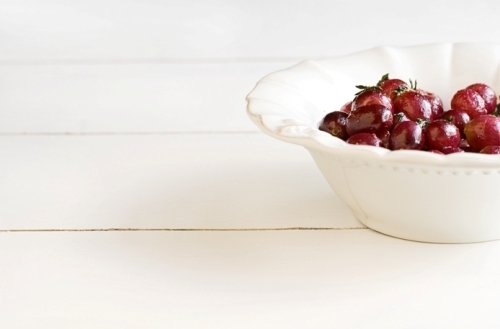 Wash grapes, drizzle with a couple of tablespoons of olive oil, salt, pepper, and few fresh thyme sprigs. 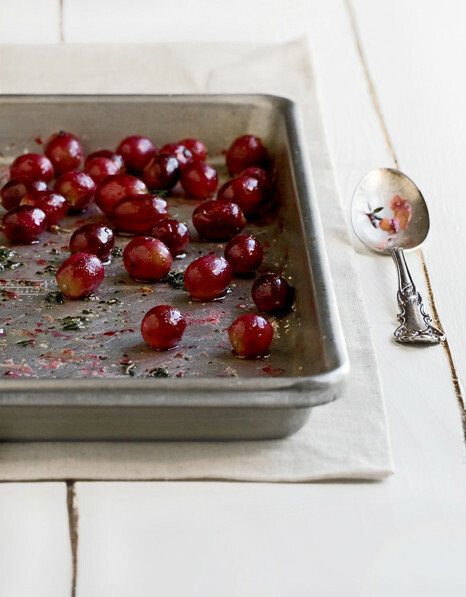 Place grapes on a baking pan, and bake at 400 for about 15-20 minutes, until they are tender and wrinkles start forming. Ehm, yeap, that's it...over and out.